Adinah served up a nice breakfast for us and we hung out and visited for a while. It was going to be another sunny warm day. 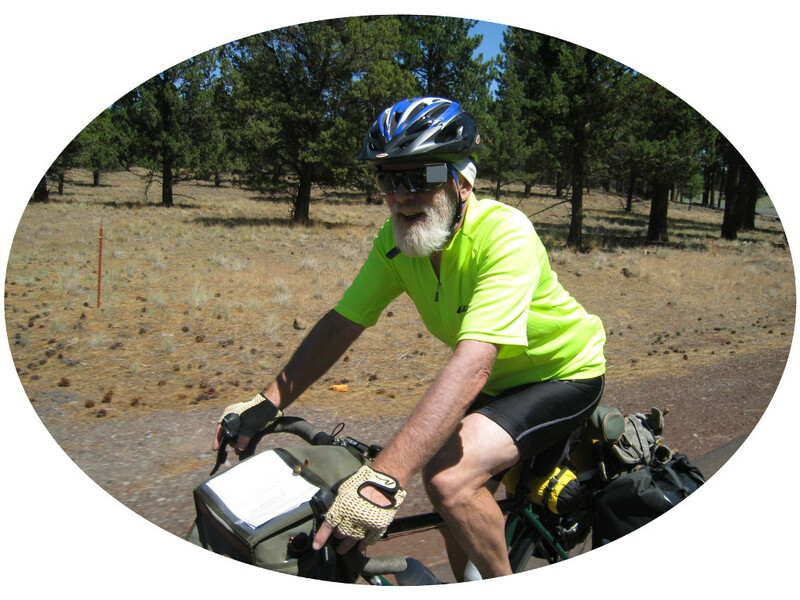 We decided that John and I would ride up to Ochoco Divide and Chris and Adinah would meet us there, after doing some exploring on there own. We knew it was 25 miles to the summit and 2000 foot elevation gain. It turned out to be a great climb with only one short 6% section. The country changed again, first going through some nice farmland before climbing along Ochoco Creek. It was green and well watered the whole way. Soon we climbed out of the junipers and into the pines. I knew there was a campground at the top having stayed there on the way to Idaho in 2005. to put things into perspective, on that trip this was our stop the first night out. By bike it took me a week. Adinah and Chris met us at the top and we had a nice lunch. It's great to be eating some good food. They decided to go look for the "Painted Hills" while we finished our ride to Mitchell. It was a fast downhill from Ochoco Divide into completely different country. Much more arid with sparse junipers. The exception was a very nice farmstead along Bridge Creek, with a garden and an orchard. It was the first I have seen people growing food for humans instead of cows on the trip so far. Soon the road leveled off and it got very hot. We had a few miles to go to get to Mitchell. All we know about Mitchell was that they allowed camping in the "Lions Club park". When we got here we could see it was a really old, run down down, and we weren't sure what to expect. But sure enough there was a nice park with some willow trees, along the creek, and some tents already setup. 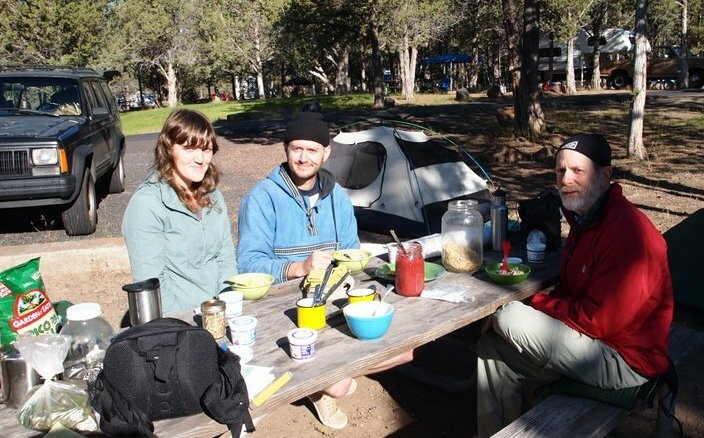 We pulled right in to a picnic table under a roof, with lots of grass to pitch our tents. There was water and a bathroom with a flush toilets! All for free. It seemed ironic that the smallest, poorest town, would have the best accommodations for cyclists. We went into the store and they even had us sign their guest book. Soon Adinah and Chris showed up and we sat around, I played her guitar, we had some snacks and beer. Then Adinah made the best dinner I've had in a long time. Lentil burgers and salad. Wow! Soon some other cyclists showed up, also heading east. They are Jim and Kathy and you can read about there trip here. Jim soon discovered that someone in the neighborhood had an opened wi-fi access point. Here we are, on the edge of nowhere, far from cell phone service, and we have wi-fi! Not only that but the little roofed in area has power outlets. Out come the laptops, iPhones, blackberries. Kathy even has an iPad. It seems bicycle tourists are all techies. We all had to get to work on our blogs! It was great that Adinah and Chris could meet me. They love camping in this part of the state. First summit since the Cascades. Won't be the last.